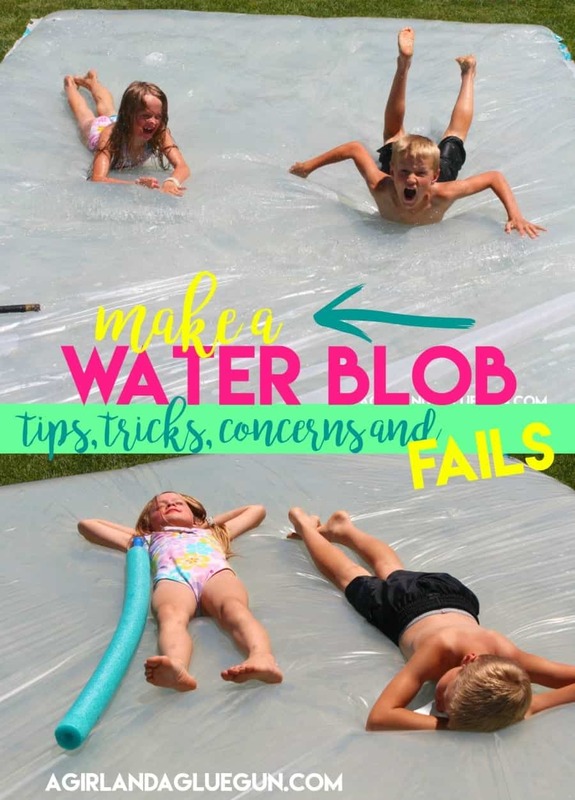 I’ve been pinning and sharing water blobs for the past few summers…and I finally decided it was time to make my own! I had a few concerns….and I’m sharing what worked for me….and things that were craptastic. I actually did a facebook live video as it was filling up—You can head HERE to watch it! So here was the concerns..
B. So many holes. I ironed it pretty well… I thought. 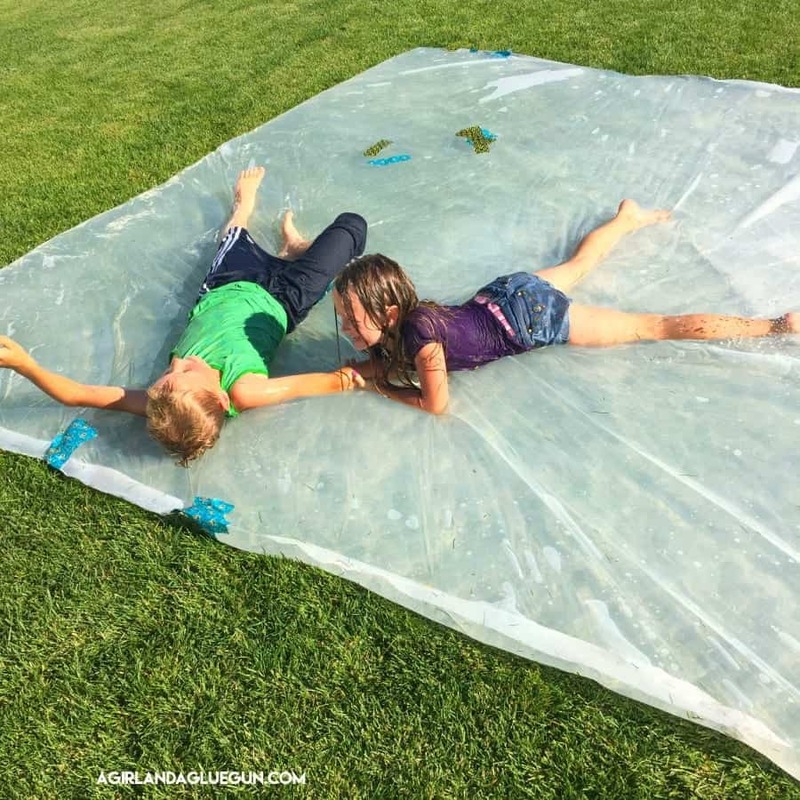 We had a roll of duct tape to patch any holes…but maybe it was too big with too much water…or my kids were too rough (they did use it as slip and slide at one point!) but it was covered with duck tape at the end of the day! C. Food coloring was a bust. Unless you add super concentrated stuff –After it got all mixed in you couldn’t even tell. BUT it was super cool to see it spread around at the beginning. D. I was concerned about age appropriateness. 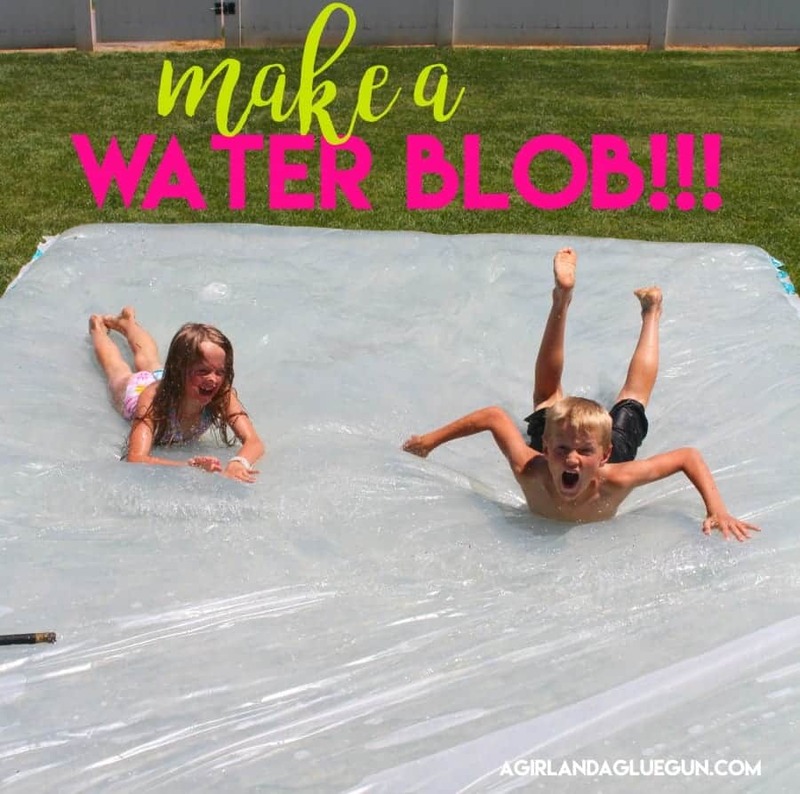 I think it’s perfect for younger kids…water fun without the fear of drowning. But my kids loved it. (8 and 10) They would have loved it more if they had friends out there with them–the two together got bored fast. They actually loved playing on it before I sprayed it down with water. 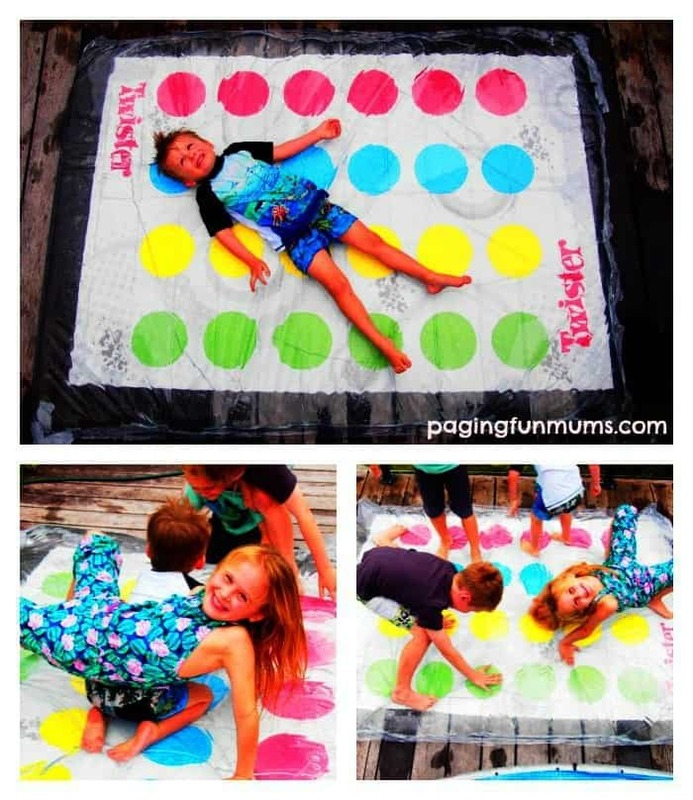 They could sit on it and play with their toys and get cool but not soaking wet. BUT after 5 hours when the water was all over it…it got a new life and they had a blast getting soaked again in their clothes. E. The heat. it was 88 degrees outside. When I was draining it…the water was quite warm (6 hours after filling it up) I would definitely tell you to keep an eye on it with young kids. 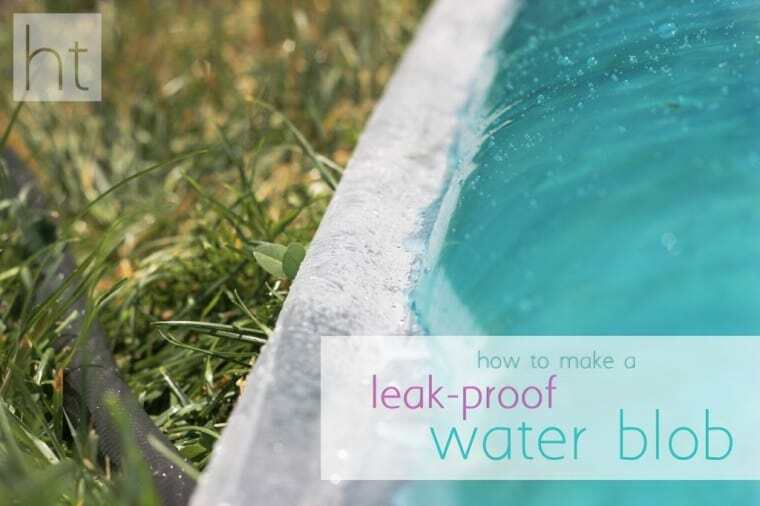 If you hose it down with a little water it should be fine! 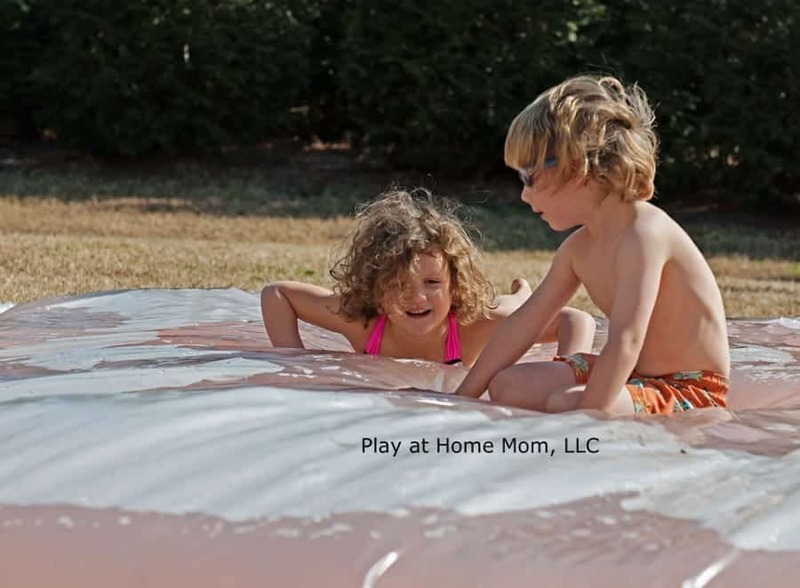 The plastic was warm too…but hotter weather could make the plastic hot! G. $$$ Someone on my facebook page said, “Sounds like a lot of work and money for something you are going to throw away” BUT look at it this way. 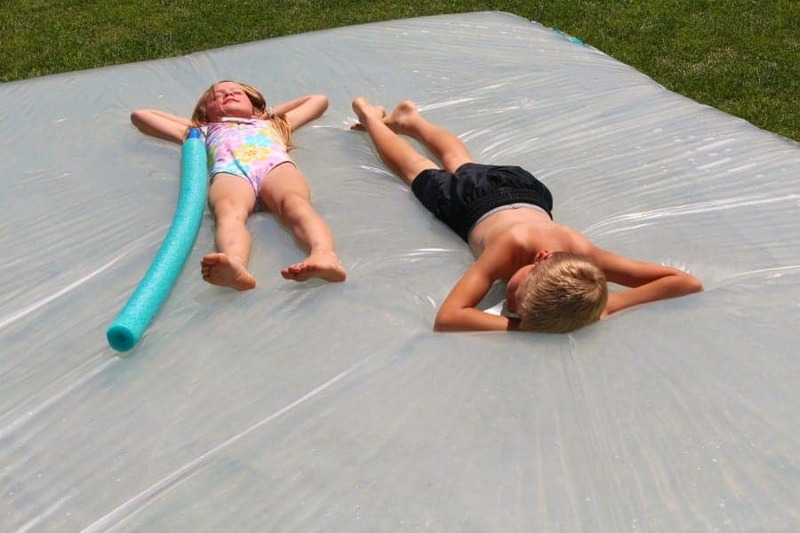 To take my kids to the pool–it’s $28. Plus I have to pack treats. This was $10…an hour 1/2 of my time to iron and set up. (aka…2 CHUCK episodes on netflix) Then I got to work on this old blog for 4 hours while they played. so to me ….totally worth it. SO….would I do it again? BUT. I wouldn’t do it too often. Once a summer at the most. I wouldn’t want my kids to get bored of it. What do you think? Have you tried this? Wanting too? Let me know! 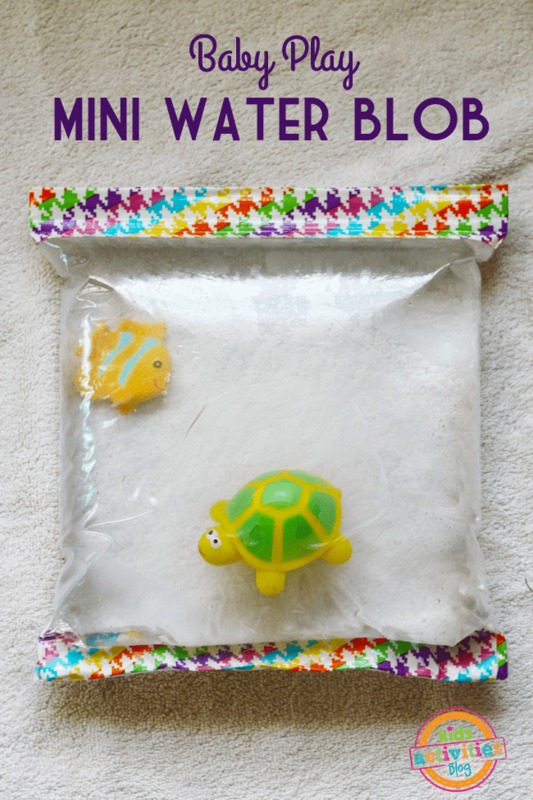 and here is the MINI blobs! Not ready to commit…make a mini version!